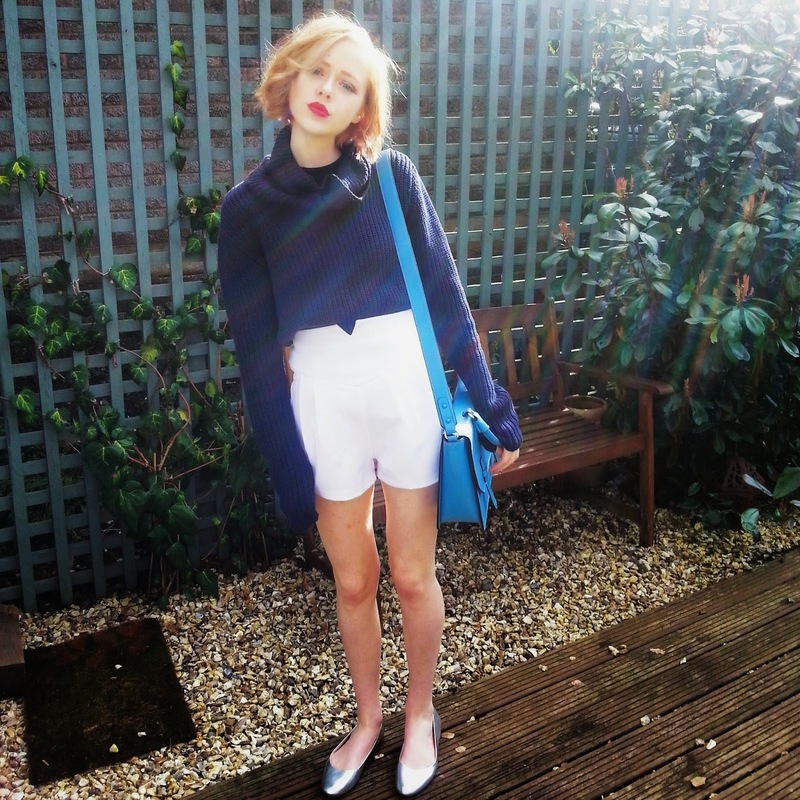 This beautiful navy cowl neck jumper is by Topshop Boutique. I love this jumper - lovely and classy but also has extra long sleeves which gives it an added cosiness. The material feel really nice and luxurious too! The colour is great to style with a bit of black and white. These white high waisted shorts are from Missguided. They make the blue colours in this outfit more defined whilst also adding a very clean style to the look. I really like the high waisted style, it's super flattering. These metallic ballet pumps are from H&M and are new in. I love the metallic trend; grab some of these if you can. They are a great way to work a bit of texture (if that's what you'd call it) into an outfit. My satchel was bought in the Topshop sale a couple months back. 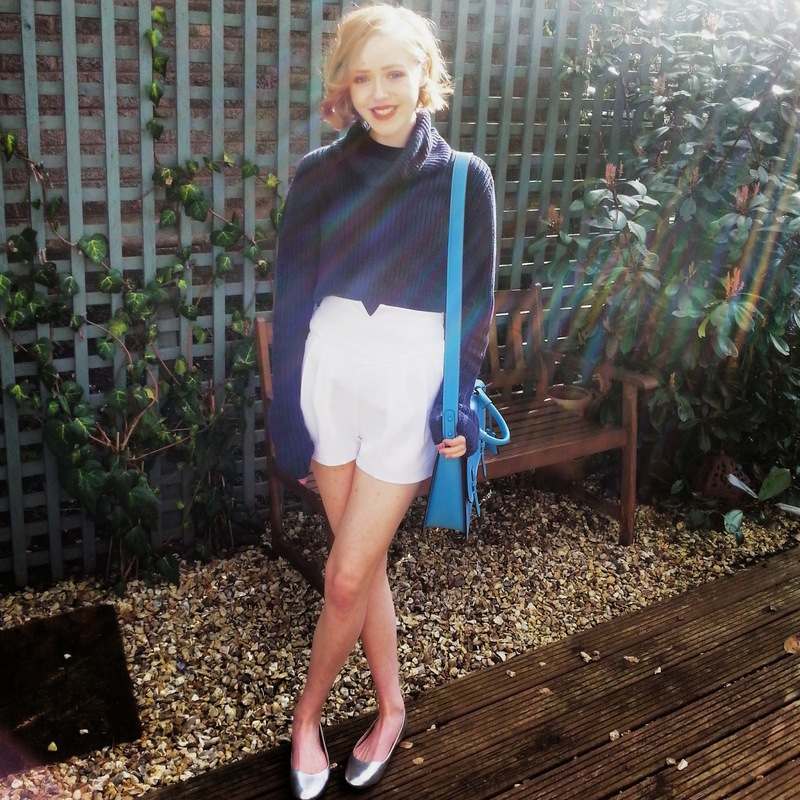 The bright blue adds a quirky look to the classic satchel bag, which I love and contrasts nicely with my navy jumper. The two different shades of blue make this look just that little bit different. On my lips is MAC Red Lipstick. It has a satin finish and is one of my favourite go-to's. What do you like about this outfit? You're stunning! I love your style and your blog/Instagram is so inspiring. This outfit is so classy. I love it so so much. Especially those shorts! High-waisted anything is my faaavorite. And I don't even normally like cowl neck sweaters, but it looks gorgeous on you! Great style, and you are so beautiful!